Two piece dress of tan brocade with light blue accents and satin ribbon of light blue and brown; hourglass silhouette. 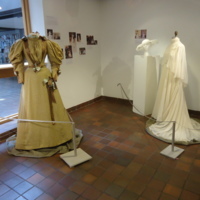 Bodice (a) is boned; band collar closes at center back with metal hooks and eyes; leg o'mutton sleeves; four back princess seams, two side seams, fitted panels on each side with brown stain ribbon in v-shape on bodice front and back, center front gathered panels closing over separate fitted lining with metal hook and eye closures; bows at center front and center back waist, wrists, shoulders, and neck; natural straight waist; twisted edging of brocade and brown stain at waist; dress shields in both sleeves. 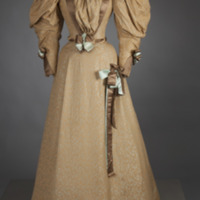 Skirt (b) is gored with pleated back; floor-length; hook and eye closures at center back; bows of light blue and brown ribbons at front left. 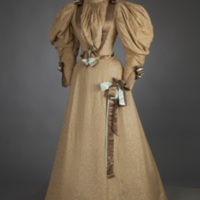 This dress was worn by Isabel Miller, grandmother of Isabel Plambeck (Vassar class of 1962) and Mary Agnes Norman (Vassar class of 1959) and mother of Isabel Board Foshee (Vassar class of 1931), for her wedding to Milton Board in Hardinsburg, Kentucky in 1895. 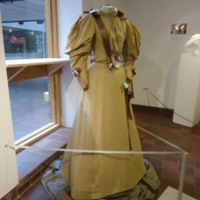 A foam mannequin was carved to accommodate the lower, smaller waistline, then the mannequin was padded with batting to match the size of dress. 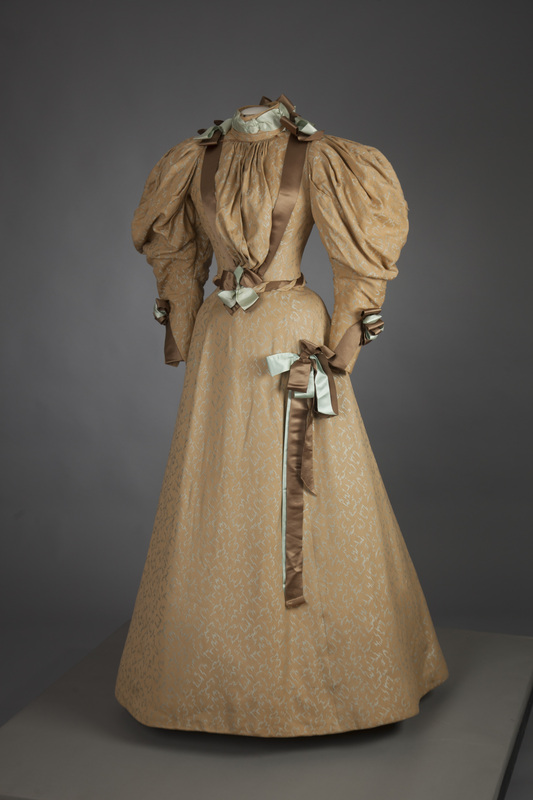 A cotton knit cover was placed over the padding, and a full petticoat was dressed on the mannequin to help support the skirt. 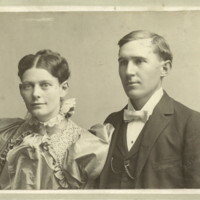 Mme. 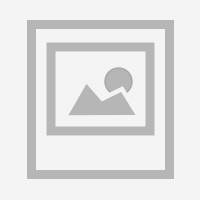 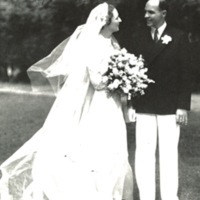 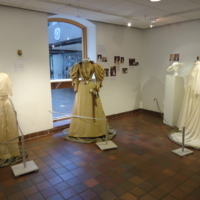 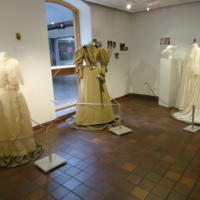 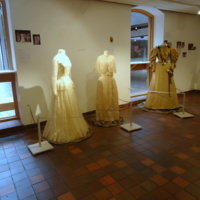 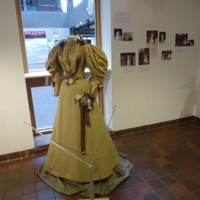 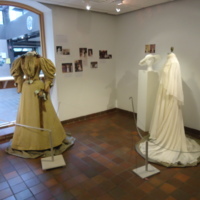 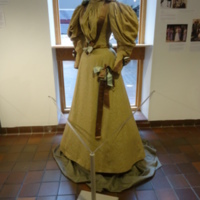 E. Saunders, “Wedding Dress of Isabel Miller Board,” Vassar College Costume Collection, accessed April 20, 2019, http://vcomeka.com/vccc/items/show/4253.